The redFox Environmental Cajun Crusher was specifically engineered to perform under the rigorous demands placed on equipment operating in the marine industry. High performance levels and product dependability demanded of all redFox Environmental products are built into every model. 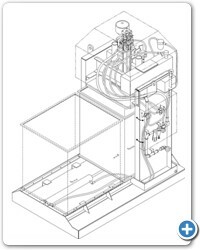 The redFox Environmental Cajun Crusher line is designed to deliver trouble-free service, with continuous operation and normal routine maintenance. With an estimated life expectancy of 15 years, the redFox Cajun Crusher will also deliver true economy and value. You won't have to send your personnel to school to learn to operate the redFox Cajun Crusher. The controls are easily accessible in a closeable panel, and afford the operator total control from one station. Click on image below to see the Cajun Crusher in Action! Operator safety was given a high priority in the development of the redFox Cajun Crusher product line. 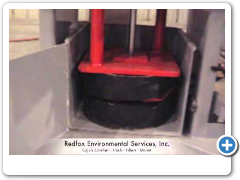 Structurally, all models of the redFox Cajun Crusher are fabricated to withstand heavy loads and constant use without failure. Wiring harnesses and all electrical, pneumatic and hydraulic components are routed to afford maximum safety to personnel as well as provide efficient performance. Controls are housed in explosion-proof protectors where needed. The vast majority of our units are air operated using techniques that deliver foolproof operation. Length: 4' 0" Length: 7' 0" Length: 7 10 1/2"
Width: 3' 10" Width: 4' 6" Width: 5' 2"
Height: 7' 1" Height: 8' 3" Height: 8' 9"
Weight: 2000 lbs. Weight: 3800 lbs. Weight: 4000 lbs.